What has Canada contributed to the LHC? Canada is not a CERN member state (we are not in Europe...) so instead of paying membership fees to CERN, we made a substantial in-kind contribution through TRIUMF to the construction of the LHC. In the 1995-2000 Five-Year Plan the TRIUMF laboratory was given the mandate to act as Canada's main connection with CERN and to develop and construct components for the Large Hadron Collider. The agreement that was subsequently signed between TRIUMF and CERN involved a $30M contribution made up of $19M in equipment (materials and supplies) and $11M in TRIUMF salaries. 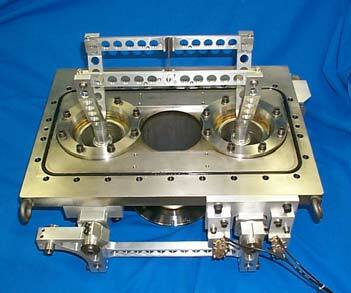 In the initial phase TRIUMF was asked to work on the upgrades to the injector synchrotrons. 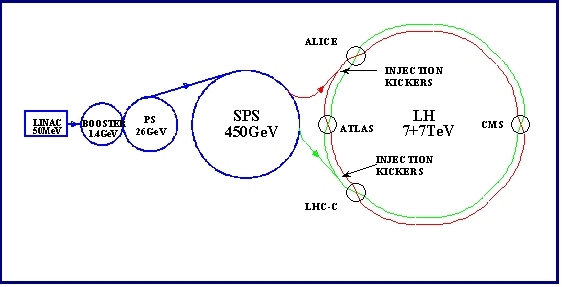 The injector upgrade, called the PS Conversion for LHC, is necessary to provide proton beams with a factor two higher brightness, more strictly controlled emittance, and a different bunch spacing for LHC operation. Layout of the CERN complex of accelerators. The Canadian contribution here has been the ferrite rings and the tuning and high-voltage power supplies for the four new first-harmonic rf cavities for the PS Booster, all the magnets and power supplies for the upgraded 1.4 GeV transfer line between Booster and PS, prototype development of the 40 MHz cavity for the PS and higher order mode dampers, new transformers for the Booster main magnet supply, and a reactive power compensator to reduce transients on the electrical grid. Some specialized beam instrumentation and electronics were developed at TRIUMF for this upgrade. In addition the beam dynamics group assisted in beam simulation studies towards higher currents in the Booster. By 2000 all of the tasks included in the PS Conversion project were completed by TRIUMF and commissioning of the beam initiated. By the end of the year the nominal LHC beam with the required protons/bunch in an emittance below the allowed limit and with 25 ns bunch spacing was produced. 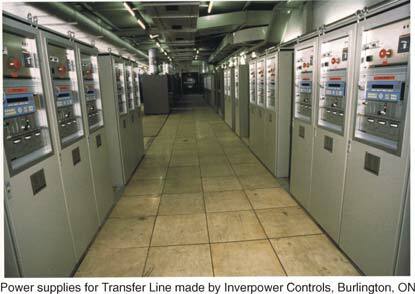 Some of the equipment provided by TRIUMF during the PS Conversion project. 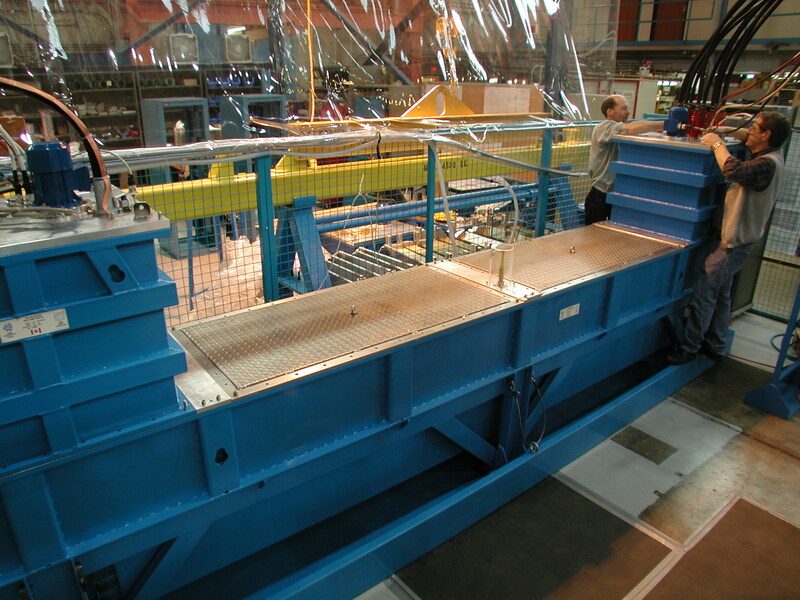 In 1998 TRIUMF initiated prototype developments on two large projects for the LHC itself. 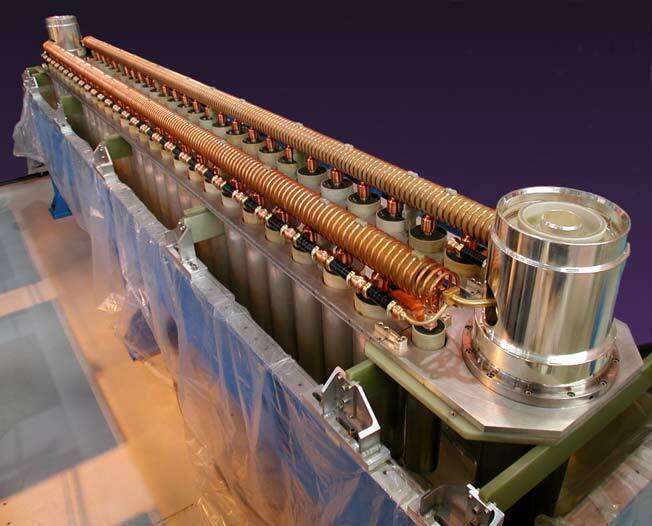 The first involved the development of a prototype resonant charging power supply for the LHC injection kickers as an in-house project and the second, working with industry, the fabrication of a prototype twin-aperture quadrupole magnet for the focusing elements of the beam cleaning insertions of the LHC. The completion of the full scope of this involvement, which included the production of the components for four LHC injection kicker systems and 52 of the quadrupole magnets required additional funding which was requested as part of the second Five-Year Plan (2000-2005). This funding was provided in the second Five-Year Plan at a level of $11.5 million. Each of the LHC injection kickers consists of one resonant charging power supply, two 5 ohm pulse forming networks, four thyratron switch tanks and two kicker magnets (to be made by CERN). The stability and pulse uniformity requirements are at the level of 0.1% which is unprecedented for such a device. TRIUMF personnel completed accurate simulations to verify the design of the pulse forming networks and then fabricated and assembled the components. A new clean room and assembly area was constructed at TRIUMF for the assembly and testing. 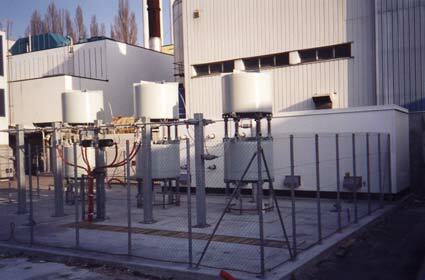 By March 2003 the five power supplies were built and tested, the nine pulse forming tanks were assembled and the switch tanks were nearing completion. View of the pulse-forming network before being placed in its 5.2 m long tank. A TRIUMF beam physicist played a significant role in the optics design and specification of the collimation system for the beam cleaning insertions in the LHC. This system is required to remove any beam lost during the acceleration and collisions in order to protect the superconducting dipoles in the rest of the ring. 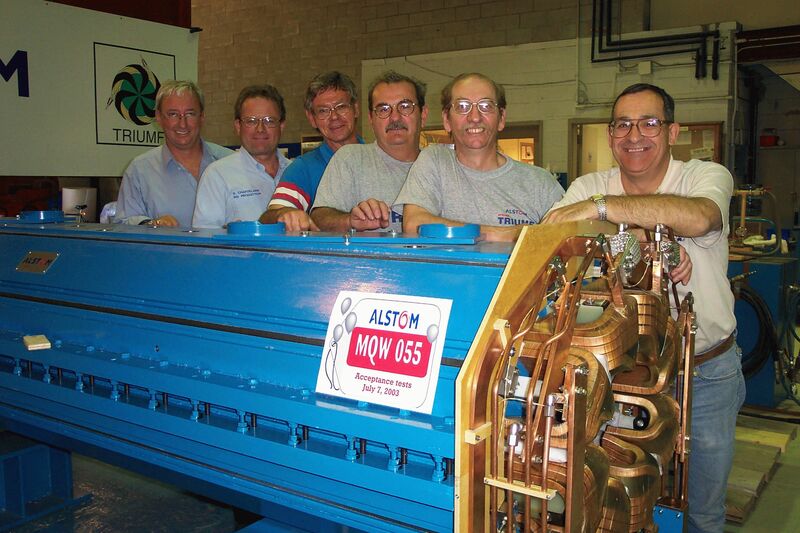 Series production of the twin-aperture quadrupoles began at ALSTOM Canada in Tracy, Quebec in 1999. The prototype magnet, that had been built by ALSTOM, did not meet the magnetic field requirements and changes had to be made to the lamination design and assembly tooling to substantially improve the assembly tolerances. 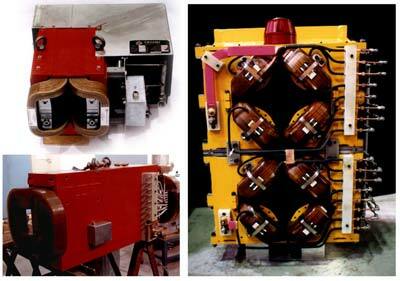 The first magnet was not delivered to CERN until March 2001, about one year late. ALSTOM experienced difficulty in several areas: maintaining precision on the punched laminations, fabricating and vacuum impregnating the coils and welding the stacks of laminations without distortion. Eventually these problems were solved and the magnet met the required mechanical tolerances and passed the magnetic tests. It should be pointed out that this magnet had to be assembled with much higher precision than is common for normal quadrupole magnets due to the small aperture required to get the necessary high field gradient. Once the assembly problems were sorted out, ALSTOM were able to produce high quality magnets at the planned rate of two per month. By April 2003, 38 magnets were delivered to CERN and the contract was expected to be completed by August 2003. Mechanical verification of the magnet assembly tolerance is carried out at the factory prior to shipping and the magnetic field mapping of the magnet is carried out at CERN. 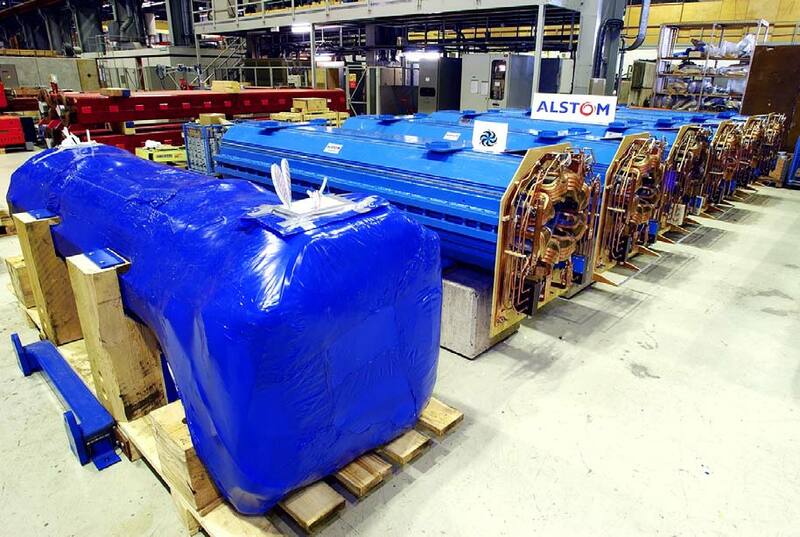 A number of the 52 twin-aperture quadrupole magnets manufactured by ALSTOM Canada and delivered to CERN. 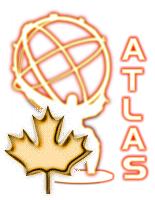 An important aspect to the accelerator work has been the involvement of Canadian industry in the development and fabrication of components to ensure a significant Canadian content in the contribution. In fact the individual tasks have been selected based on the technical expertise that existed or could be developed at TRIUMF together with the availability of Canadian industry to supply a high fraction of the components. Approximately 90% of the total contribution has been spent in Canada. There are a number of spin-offs from this activity. The companies I.E. Power, Inverpower and Digital Predictive Systems in Ontario were awarded $3.7M in contracts for high current power supply design and fabrication for the PS Conversion project. Since their work with TRIUMF, the expertise gained in developing high precision pulse mode power supplies has allowed them to compete favourably in the international market. They have received contracts from Brookhaven, Los Alamos, SLAC, Argonne and the Canadian Light Source in excess of $10M and are continuing to get more work. ALSTOM Canada located in Tracy, Quebec was awarded the contract for the prototype and series production of the twin-aperture quadrupoles. This work required them to meet much higher assembly tolerances than their previous experience in fabricating generators for the power industry and to set up improved quality assurance procedures for this type of work. These procedures are now being used elsewhere in the plant and the company and its subcontractor for the coil fabrication have been asked to bid on other magnet projects. The team at ALSTOM in Tracy with the last magnet. The PFN in the final stages of assembly with Mike Barnes and Gary Wait. The installed string of MQW magnets.